A Thousand Oaks Barrel Co. original! This hanging wine & whiskey bottle holder is made from 1/2 ..
Wine Enthusiast 12 Bottle Cube-Stack Wine Rack - Desktop - 15.5" Height x 18.9" Width x 10..
Wine Enthusiast Cube Stack X-Style Wine Rack - 15.5" Height x 18.9" Width x 10.6" Dep..
Wine Enthusiast Compact Cellar Cube Wine Rack - 20" Height x 20" Width x 9" Depth - 4..
New and Improved--Stronger in Mahogany! Sourced from the finest sustainable tree plantations in..
Dimensions: 9" x 7" x 29" Disclaimer: Ships t..
Barrel Wine Rack (30 Bottle) - Made from a wine or whiskey barrel, this beautiful wine rack holds 30..
Blue Wave Stiletto (P/N SHOE234). The Blue Wave shoe is the right accessory for all occasions!.. Classic Black Stiletto Wine Bottle Holder (P/N SHOE201). The Classic Black shoe is sure to go ..
Eva Solo Wine Rack Kit (P/N 567724). With our Eva Solo wine Rack Kit, you'll never make a ..
Fleur De Lis Wine Rack (P/N XF00571). 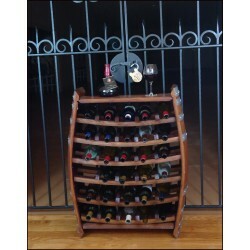 The rack is constructed from durable iron and features a..
Iron Six Bottle Wine Rack (P/N ME579). Six smooth curves of galvanized iron sheet cradle wine .. Lust Red Sequin Stiletto Wine Bottle Holder (P/N SHOE221). The Red Sequin shoe will create lus..
Nambe Zen Wine Rack (P/N MT0394). The rack uses Nambe Alloy, our signature metal that polishes..
Vynebar 8-Bottle Black Vertical Wine Rack (P/N VB8PBK). Chic and innovative, the Vynebar Verti..
Vynebar 8-Bottle Silver Vertical Wine Rack (P/N VB8PS). Chic and innovative, the Vynebar Verti..
Stack racks high and save on space-easily adjust the size and configuration of a stemware collect..
Zebra Stiletto Wine Bottle Holder (P/N SHOE204). The flirty Zebra Print shoe is sure to go wit..